Your new product introduction is too important to leave open to errors. 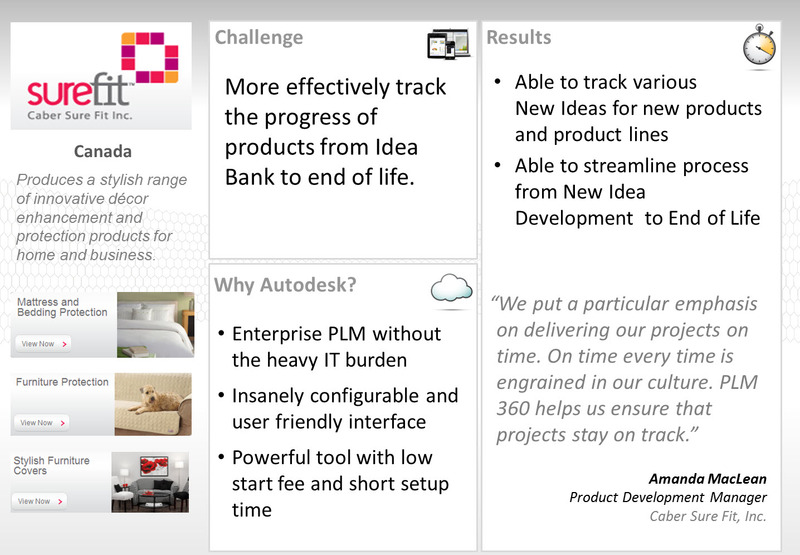 Don’t miss product launches, keep costs in check, and enhance your competitive advantage with Autodesk’s PLM 360. Caber Surefit took advantage of PLM 360 and the New Product Introduction app and was able to take ideas to a fully finished product. Amanda MacLean, Product Development Manager, recognized the positive impact PLM 360 had on their business, “We put a particular emphasis on delivering our projects on time. On time every time is engrained in our culture. PLM 360 helps us ensure that projects stay on track.” Being able to streamline their design processes allowed the Caber Surefit team to stay on the same page throughout the product development. Explore PLM 360 and all of its apps. Questions? Contact us or ask an expert.